No kidding! 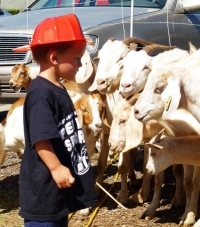 Youngsters had a great time at the San Miguel Fire open house in Spring Valley earlier this month, where this boy got a close-up look at goats owned by Johnny Gonzalez; the four-footed brush clearing team is used to create firebreaks in East County’s rural areas. 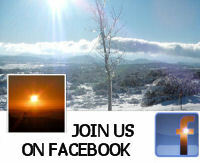 Photo by Miriam Raftery. 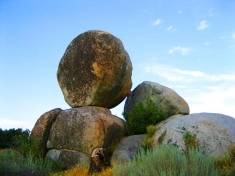 “My son grew up here in Boulevard and loves what God gave us,” wrote reader Leslie Mauris, who submitted this photo of boulders balanced as if by divine design. "No more powerlines!” Dennis Richardson of Lakeside captioned this image of high voltage lines that already traverse his community---before construction of Sunrise Powerlink, which is slated to bring even more. 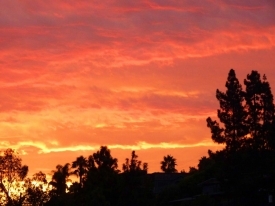 Who says we don't have four seasons in San Diego? 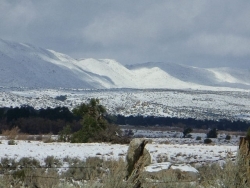 Leslie Mauris of Boulevard snapped this pristine image after a winter snowfall blanketed East County's back country.